Punk and hip hop bands performed on Monday evening under the slogan "there are more of us", in response to the far-right slogan "we are the people". Many people chanted "Nazis out". Earlier on Monday a migrant, believed to be Afghan, was sentenced to more than eight years for killing his German ex-girlfriend. The case sparked national outrage and was seized upon by far-right groups as part of their anti-migrant campaign. The concert began on Monday evening with a minute's silence for the victim of the stabbing attack. Soon after, a singer from the group Kraftklub addressed the crowd. "We're not naive. We're not under the illusion that you hold a concert and then the world is saved," he said. "But sometimes it's important to show that you're not alone." At the same time the concert was taking place, local police announced that they had arrested a man suspected of attacking a journalist during far-right demonstrations on Saturday. 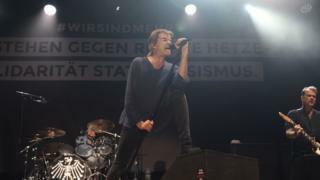 Image caption Many at the concert displayed anti-Nazi signs, while some chanted "Nazis out"
But the concert was not without its opponents. German President Frank-Walter Steinmeier was criticised by some conservatives for posting the event to his Facebook page, as one of the bands performing had previously been prosecuted for advocating far-left violence. Image caption Attendees held signs like this one, which reads: "You are more foreign to us than any refugee"